I love working with felt; it is really easy to think of simple felt craft ideas for any occasion. 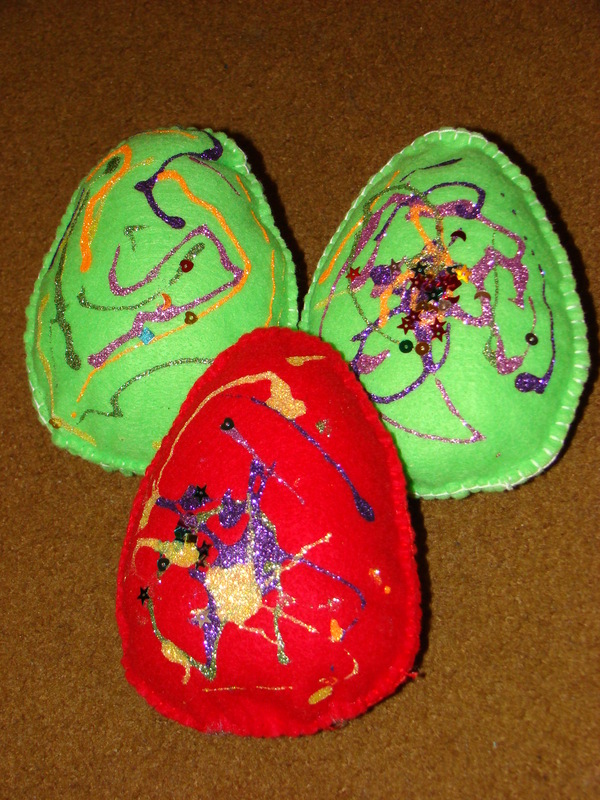 So, for Easter we have made Felt Easter Eggs! Cut out 2 egg shapes from the felt. Decorate the shapes. We used glitter glue because the kids love it, but fabric paint will work just as well. We also added some sparkles/sequins to the eggs for a bit more decoration. When the glitter glue/fabric paint has dried sew the 2 sides of the egg together, leaving a small gap through which you can stuff the egg. Once stuffed, sew the gap closed. An important note here is that it has taken almost 3 days for the glitter glue to dry fully on our eggs, so don’t expect to sew on the same day as you decorate!